LACO Technologies has been manufacturing gas leak standards since the 1990’s. For years we used traditional leak element technology to produce leak rates in our leak standards (i.e. Teflon® Permeation, Crimped Metal Capillary, and Glass Permeation). However, we were never quite satisfied with the performance of these leak elements, and neither were our customers. This pushed us into developing a new leak element technology which could offer far superior leak performance — one more reliable and rugged, with the capability of producing quick repeatable results. LACO’s solution is the Micro Tube Capillary (MTC) leak element which has now become the standard technology we use in all of our calibrated leak standards. The leak element is used to control gas leak rates in calibrated leak standards. It is an internal component which sits behind the outlet connection of a leak standard and produces a constant flow of gas, based on the differential gas pressure across it. The MTC leak standard was tested and validated over an extensive time period and multiple environments to ensure high reliability of the leak standard in extreme manufacturing environments. The MTC leak standard uses a proprietary process to create a leak-tight seal around a capillary tube. The leak element seal for most leak standard designs is all-metal and elastomers are not used in the seal. The leak standard is designed to be resistant to shock, vibration and plugging due to particulate contamination. Unlike metal crimped capillary leak elements, the MTC design does not have induced stresses or the potential for corrosion or creep. This means your leak standard remains accurate over extended time periods even if it experiences harsh environments. Testing and validation were performed to determine long-term reliability and repeatability of the Micro Tube Capillary leak standard. Test and validation protocols included a wide range of exposure environments by using both internal resources and outside independent testing labs. Before and after each exposure, the leak rate was measured to determine the effect of the exposure. The sample of leak standards used in this study experienced zero failures due to either plugging or variations in leak rate values. Based on the results of this validation, LACO is confident the materials, design and manufacturing techniques used produces a repeatable product which is extremely reliable in the harshest environments and over long time periods. LACO’s Micro Tube Capillary Leak Standards can now be seen in use all around the world in an array of different applications and environments, and rarely experience failures. Another type of leak element used by some leak detector OEM’s (e.g. Adixen Vacuum Products) is Ceramic permeation. Ceramic leak elements in Adixen leak standards are more stable than Teflon®, but are also more fragile. A common issue with these is that the seal around the element cracks, and for some time (days, weeks, or months) the leak rate is higher than it should be, and then begins quickly decreasing to nothing. This can be caused by sharp impact, or it will eventually happen on its own over time. Also the temperature coefficient on ceramic leaks is 3% per ° Celsius. 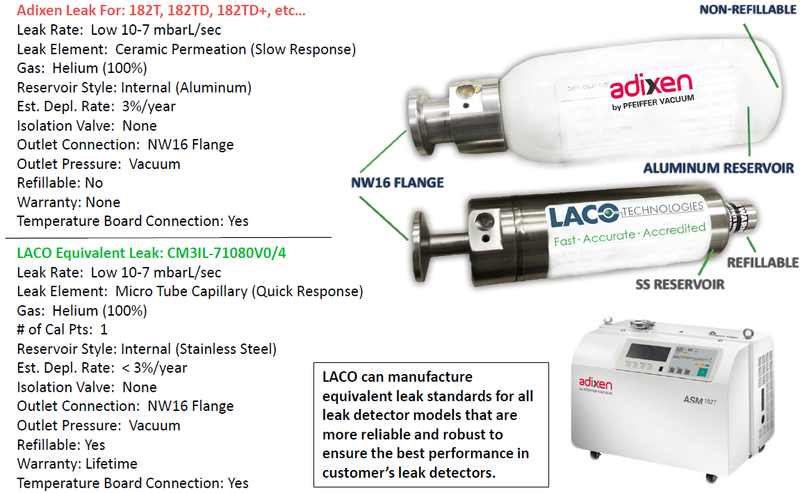 Comparison of common Adixen/Alcatel Leak Standard and LACO Micro Tube Capillary Leak Standard. LACO’s manufacturing process and product design have been validated to ensure consistency and stability of the Micro Tube Capillary leak standard. Many customers worldwide are also using Micro Tube Capillary Leak Standards with great success. LACO MTC leak standards offer quick gas signal response, extreme ruggedness, high accuracy, and provide reliable and repeatable results. Contact LACO’s sales team at calibrations@lacotech.com to learn if the Micro Tube Capillary leak standard is right for your application and enjoy our Fast, Accurate, and Accredited service. LACO&apos;s calibration laboratory is accredited in accordance with the recognized International Standard ISO/IEC 17025:2005 general requirements for the competence of testing and calibration laboratories. Our laboratory also meets the requirements of ANSI/NCSL Z540-1-1994 and any additional program requirements in the field of calibration. Great Western Registrar, LLC (an ANAB-accredited CB) has assessed the quality system of LACO Technologies and declared that our quality system is in conformance with ISO 9001:2015.